"Lake Effect Robotics" is the FRC team of the Limestone District School Board, consisting of 54 students in grades 7 to 12, from 6 different schools. This year we competed against over 91,000 students on 3,647 teams from 27 countries in the FIRST Robotics Competition (FRC). After two qualifying events and the Ontario Championship, we ranked 11th in Ontario to qualify for the World Championship in Detroit, April 25-28, 2018. At the championship, we were selected to a playoff alliance by team 2767, "Stryke Force" from Michigan, and went on to win our division and the championship final! FIRST (For Inspiration and Recognition of Science and Technology) is an organization that engages with youth around the world from kindergarten to high school age to help them become innovators in science, engineering and technology. The high school competition involves a different robotic "game" every year, announced in January. Alliances of 3 robots (from different teams) compete to play the game. Teams have only 6 weeks to design and build their robots, which can be up to 150 lbs in weight and 5ft tall. This year's game, called "FIRST Power Up," is themed after classic arcade games. Teams compete to place "power cubes" (milk crates in a yellow covering) on large balancing scales to tip the scale and gain ownership. Alliances earn points for the length of time that they own scales. They can also trade power cubes for "power ups" which can give them different advantages during the match. 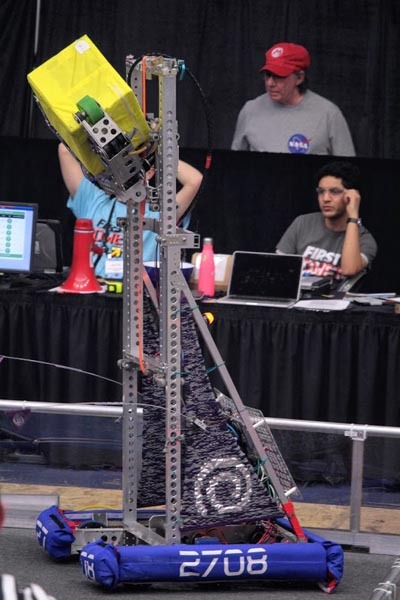 At the end of the match, robots can climb a tower to gain additional points. During the first 15 seconds of each match, robots must be "autonomous" (i.e. programmed) and earn extra points. The Lake Effect Robotics team competed at Durham College and Nipissing University this year. At Durham, we finished 9th in qualifying matches and were selected to the 5th alliance for playoffs. Unfortunately, we lost two very close matches in the quarter-finals. 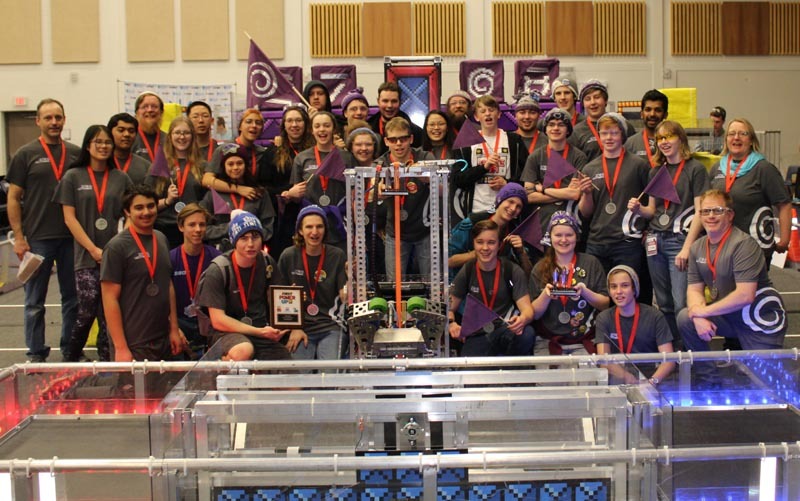 In North Bay we performed much better, finishing 3rd in qualifying and becoming captain of Alliance #2. We won our quarter-final and semi-final series but were beaten in the finals by a very strong Alliance #1. This performance, along with the Team Spirit Award and the Rockwell Automation Innovation in Control Award, qualified us for the Ontario Championships at the Hershey Centre in Mississauga. At the Ontario Championships, Lake Effect Robotics was ranked 5th in our division and became the Captain of the 3rd alliance for the playoffs. We won the quarter-final series but lost in the semi-finals to the eventual winner of the division. Along with the provincial Imagery Award, this qualified us for the World Championship in Detroit. After qualifying rounds at the world championship, we were selected by the #2 alliance in the Daly division. Our alliance went onto win the division and move onto the championship semi-finals. We finished first in this round-robin competition to move on to the "Einstein" finals, held in Ford Field stadium in front of 40,000 spectators. Our alliance won the finals to become 2018 World Champions!! Lake Effect Robotics would like to thank all of our sponsors and supporters ... without them none of this would be possible. We would also like to thank our alliance partners Stryke Force (Team 2767), Team Rush (Team 27) and Centre County 4-H Robotics (Team 4027).